Lyrics by Willem Mengelberg for the opening theme of the Adagietto of Mahler’s Fifth, quoted by Jens Malte Fischer in his biography, Gustav Mahler. This concert is my first to feature the current leader of the Boston Symphony. Opinions of him are decidedly mixed and thus intriguing. The Mahler 5 is a crazy quilt of techniques and emotions and a good first piece for my ears to evaluate the new man. Even a piece by Herr Gruber will not dampen my enthusiasm nor diminish my curiosity. The Symphony No. 5 marks a pivot in the career of Gustav Mahler in that he began to feel that he needed a refresher course in basic harmonic technique and sought out Alexander von Zemlinsky as a mentor. Mahler may well have been goaded into feeling somewhat inadequate as a composer since his wife Alma was not, shall we say, a fount of comfort and solace for him. Ironically, Zemlinsky was romantically linked with Alma before, during and after her time of partnership with the great composer. Standard history has Mahler being most influenced by Wagner and Mozart, but, at least in his middle period, which is normally considered to be his symphonies 5 through 7 (I would add the 4th with its “death fiddle”), there is the unmistakable echo of Berlioz. Unusual instruments meticulously “mis-tuned”, an ersatz horn concerto, the hammerblows of fate, dozens of unusual harmonies that float along as if having a life of their own, all are reminiscent of Symphonie fantastique (and Harold in Italy). A fine performance of the 5th is as phantasmagoric as the Berlioz in question (including its five movement structure). Nelsons wrung every shred of emotion as well as precise playing from his troops. The Funeral March was fittingly frightening, performed a little slower than most but just as emotionally raw (tell me this movement is not Berliozian!). 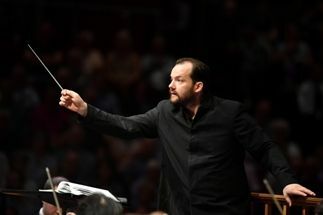 The second movement sounded considerably better than our own New York Philharmonic while striving for a similar effect of sound – here the BSO really shone as communicators of the heroic. Throughout maestro was in complete charge and led very impressively. The Scherzo is an ersatz concerto for French horn with some additions by the second chair (or assistant first if you will). Again the leadership and the playing was first rate although the hornist was not visible. As much as I personally love Mahler’s music, I have never really been moved by the last movement of either the Fifth or the Sixth and tend to “turn off” my critical faculties when these rather elongated essays come to the fore. This may be partly due to the extreme beauty of the previous movements, at least if the 6th has the slow movement immediately preceding the finale. As to the 5th there is no section of Mahler more beautiful and poignant than the Adagietto that unfolds before the finale. Think of the film version of Death in Venice if you need reminding. For me there is also a rather bizarre experience that turned out to be a beautiful memory. In my hometown of West Hartford, Connecticut, sits the University of Hartford with its very fine Hartt School of Music. I attended a band concert there once where the featured work was a wind transcription (plus harp) of this highly emotional slow movement. Although I entered the auditorium accompanied by much skepticism, I left with tears in my eyes. Nobody does that like Mahler. The Bostonians presented this movement with great respect and exquisite phrasing. This was, as Mahler designed, a precious forerunner to the finale that left one breathless. One question: why did the harpist sit for the first three movements right near the entrance door instead of making her entrance just before this jewel of an essay within an essay? The last movement was still a bit of a hash for my taste, but this is on Mahler and not Maestro Nelsons. Overall this was a wonderful performance, the best that I have ever heard live. I always taught my sons to be respectful at concerts and so I resisted the itch to boo after the mishmash that was Mr. Gruber’s offering. I won’t dignify it with an analysis however the playing of Mr. Hardenberger left much to be desired. I’ll stop now so as not to violate my own rules of comportment.